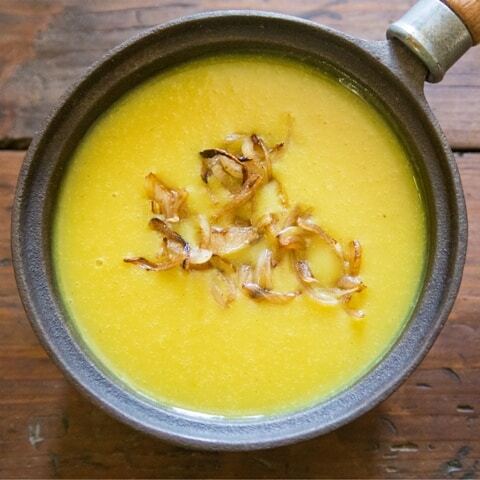 This Immune Boosting Curried Potato and Garlic Soup is fragrant, creamy and healthy and guaranteed to kick those nasty germs to the kerb. We are in the depths of a lurgy in our house, it’s day 6 already and I feel worse today than I have all week. However yesterday I mustered up the energy to cook something to blast those little bugs to hell and back. Ha! Death by garlic. The spicing in this soup is gentle and family friendly, but still plenty enough to delight jaded tastebuds. And it’s rich creaminess comes purely from the potato. There’s no need to add any cream or milk which are both mucous forming, it’s comforting enough all on its own. 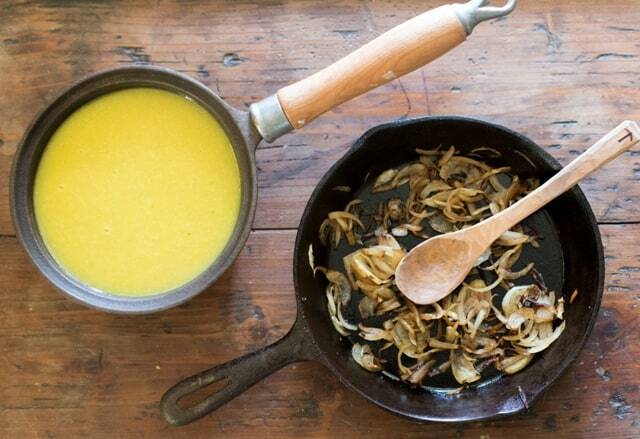 Fry the onions in the oil gently for a few minutes to soften. Add in the spices and fry for 1 minutes to release their flavour. Add in the potatoes, water or stock and garlic and let simmer until the potatoes are really soft. Whizz in a blender until beautifully smooth, adding in anything up to 1/2 litre of boiling water from the kettle to thin it down to your preferred consistency. 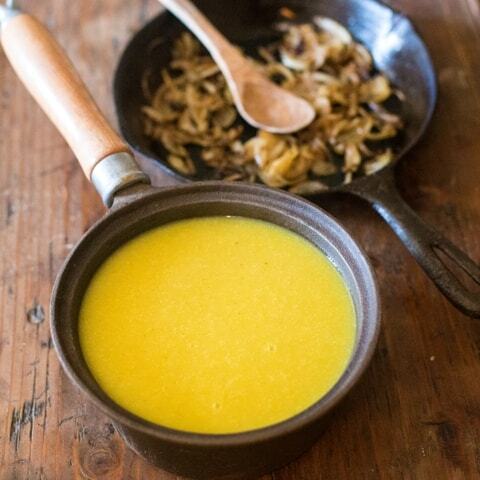 Serve with a spoon of fried onions on top if you need a little extra TLC. Thank you GG, I hope it passes soon too! That looks amazingly lurgy clearing and rib sticking. I have only made soup once this winter which is a shame as I usually love it. One to try. My gosh I could do with a bowl of this right now. This looks like it would keep everything at bay. Very healthy and immune boosting! I hope that garlic did the trick. It looks beautiful and delicious – your soups always do. Aww, thank you Choclette. I am a bit of a soup junkie! Healthy, comforting, loaded with garlic… my kind of soup! If this chill sticks around much longer, this is on the menu very very soon.